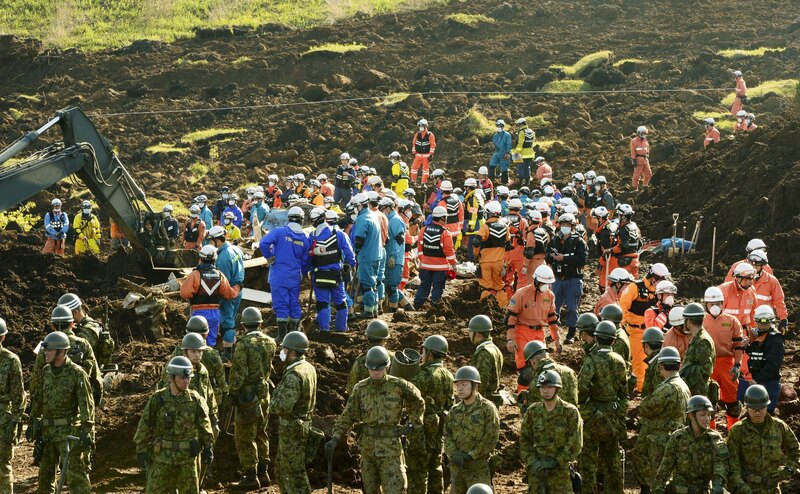 TOKYO -- Searchers found a man's body Wednesday in a landslide-hit area in southern Japan, bringing the death toll to 48 from two powerful earthquakes last week as aftershocks continued rattling the country. The U.S. Geological Survey reported a 5.8 magnitude earthquake Wednesday about 60 miles off the coast of Honshu prefecture, which was one of the hardest hit regions in the devastating March 2011 quake and tsunami. There were no reports of damage and no tsunami warnings issued after the large aftershock on Wednesday. Three people remain missing after the pair of powerful quakes that struck Thursday and Saturday. Kumamoto prefecture said another 11 people had died from illnesses believed to be related to the physical stress of evacuation. More than 100,000 people are homeless or have fled their homes in the south as aftershocks continue to shake the area. Many are living in cramped conditions in shelters or even their cars, with limited food and water.